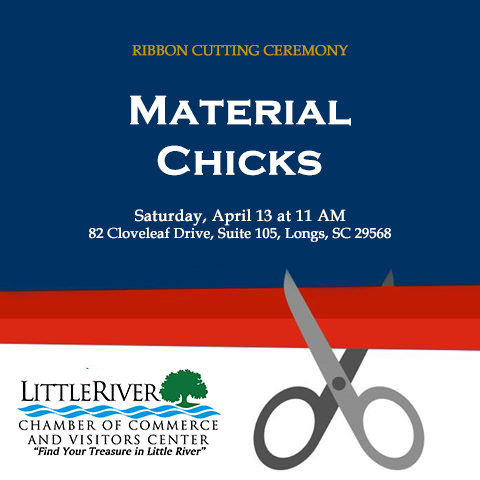 Material Chicks, previously Joann's Creations, will have a ribbon cutting ceremony with the Little River Chamber of Commerce on Saturday, April 13 at 11 AM. All are invited for day-long discounts of 20% off in-store and giveaways every ½ hour. Visit their locally-owned store at 82 Cloveleaf Drive, Suite 105, Longs, SC 29568 between 10 a.m. and 3 p.m. to see what all they have to offer. Discounts & Giveaways 10 a.m. - 3 p.m.
Free; Open to the public.